Since 1999, Smith & Wesson has been producing a modern semi-automatic pistol in collaboration with Carl Walther of Germany. Initially, the SW99 was chambered for the 9mm Luger and .40 S&W cartridges, and proved to be a reliable addition to the extensive line of Smith & Wesson auto pistols. Recently, S&W has introduced the SW99 chambered for the very popular and powerful .45 ACP cartridge. While the 9mm and .40 S&W are good cartridges, many shooters prefer a big bore auto pistol, and this new SW99 gives them one more choice. S&W has for many years produced some very reliable and accurate .45 autos in the 645 and 4506 family of pistols that have evolved into the TSW series. These pistols have metal frames of either stainless steel or aluminum, but the new SW99 uses a modern reinforced polymer frame. Polymer framed pistols have become enormously popular over the last few years, and have proven to be both reliable and durable. In developing the SW99, it is apparent that great consideration was given to the ergonomics and handling qualities of the pistol. Unlike some popular .45 auto pistols, the SW99 seems to actually be made to fit the human hand. In fact, the .45 SW99 comes supplied with two interchangeable backstraps to accommodate different sized hands. 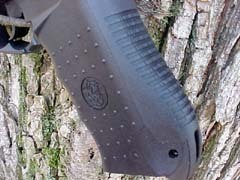 This allows the shooter to adjust the grip shape to that which is most comfortable and points the best. Another great feature of the SW99 is the ambidextrous magazine release. As can be seen in the photo, the release levers are located on either side of the trigger guard, and are very easy to reach with either the trigger finger or the thumb of the strong hand. Being left-handed, I can really appreciate this feature. 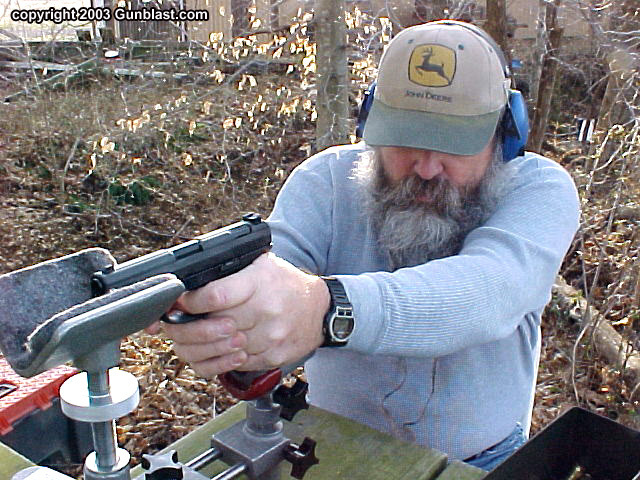 Even with the right hand, this is still the best magazine release position that I have seen on an auto pistol. It is extremely handy, but will not be accidentally activated by bumping against an object, as can be done with other designs. It can be very embarrassing to draw a pistol in an emergency and find that the magazine has been lost. 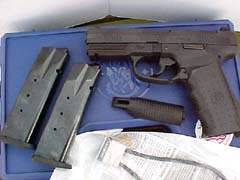 The SW99 magazine release prevents that from happening, while being very easy to operate. 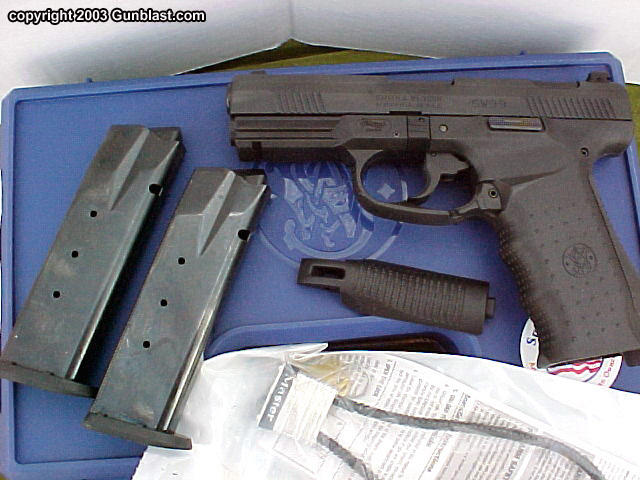 The SW99 comes supplied with two steel magazines that hold nine rounds each. The sights are easy to see, and are of the three-dot design. 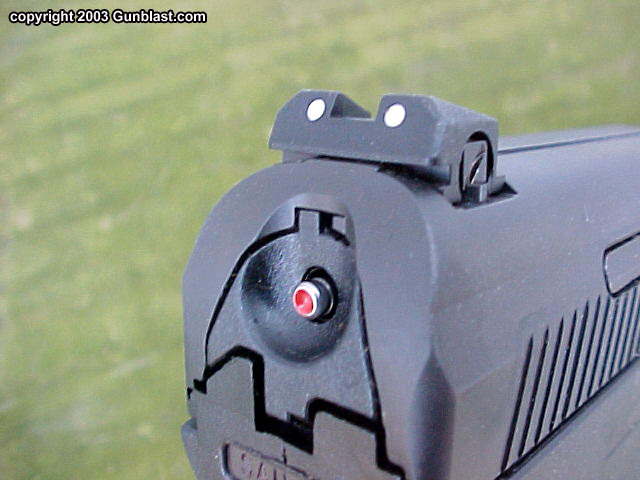 The rear sight is adjustable for windage, and the front is interchangeable for elevation adjustments. The controls of the pistol are well-placed and easy to use. 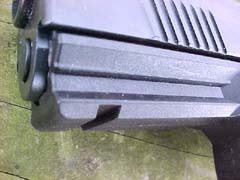 The slide release is located on the left side, and is easily reached by the thumb of a right-handed shooter or the trigger finger of a southpaw. 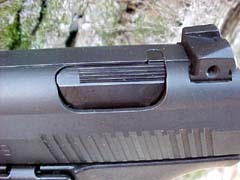 The manual decocker is located atop the slide on the left side, and allows safely decocking the striker without touching the trigger. 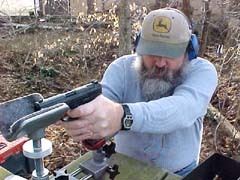 When the decocker is activated, the trigger returns to its fully forward position. The trigger is about three-eighths of an inch wide and smooth on the surface, making the trigger pull seem even lighter than its measured eight and one half pounds in the double action mode. The single action pull measured just over six pounds, but again, it felt much lighter due to the comfortable trigger shape. Another advantage of the SW99’s trigger over that of the competition is its double strike capability. In the event that a round doesn’t fire on the first strike of the firing pin, the Smith allows another quick trigger pull without working the slide. The rear of the striker on the SW99 serves as a visual and easily-felt cocking indicator. Also, whenever a round is in the chamber, a red indicator shows at the rear of the massive extractor on the right side of the slide. 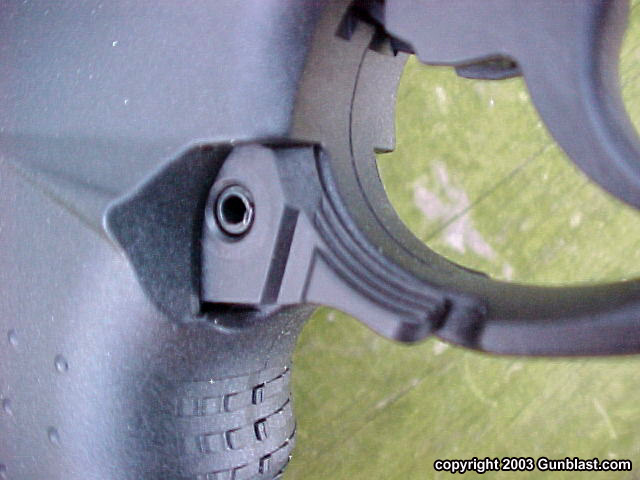 The frame incorporates an integral equipment groove just forward of the trigger guard, that facilitates the mounting of a flashlight or laser sight, if desired. The use of a polymer frame results in a gun that is about a pound lighter than a comparable sized steel frame gun. The frame of the SW99 incorporates the grip, which is textured for a good firm hold, without being abrasive. The feel of the grip is not as blocky as that of the full sized Glock .45, and should prove to be better suited for smaller hands. The SW99 has a blackened stainless steel barrel and slide, but weighs only 25 ½ ounces. The barrel measures four and one-quarter inches, and locks solidly into the slide, without a trace of movement. The trigger has three different modes of function. When the striker is in the decocked position, the first shot is fired with a traditional double action pull, with subsequent shots fired in the single action mode. 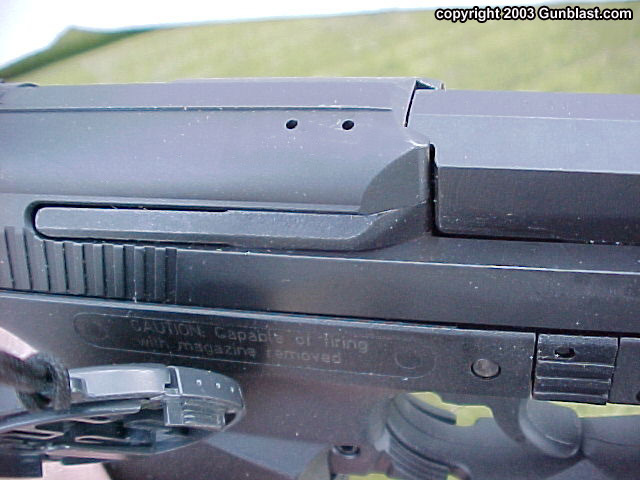 In addition, the gun can be fired from a trigger position best described as a long single action. When the slide is worked to chamber a round, the striker can be decocked, or left in this cocked condition with the trigger fully forward, resulting in a first-shot single action trigger pull with a lot of take-up. If the gun is to be holstered, it should be decocked first. Shooting the SW99 .45 proved to be very enjoyable. 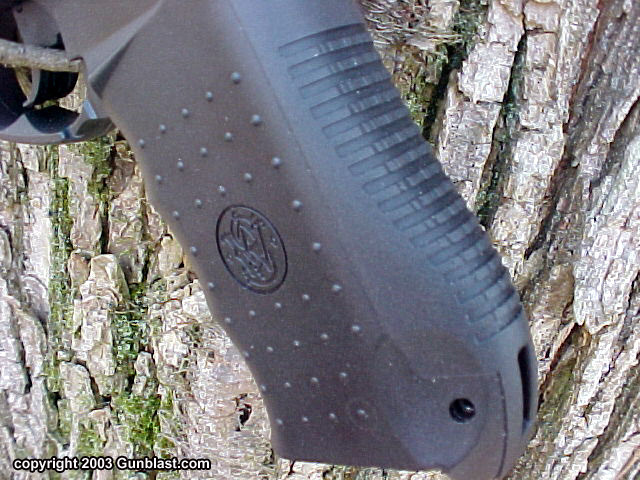 The shape of the grip handled recoil very well, allowing quick follow-up shots. I tested the pistol with a variety of ammunition, including high performance hollow points, military hardball, and target semi-wadcutters. Plus-P hollow points from Cor-Bon Ammunition in weights of 165, 185, 200, and 230 grains were tested, along with the excellent 165 grain Pow-R-Ball ammo. 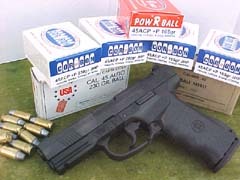 230 grain hardball from USA and some military surplus hardball was also tested in the SW99. 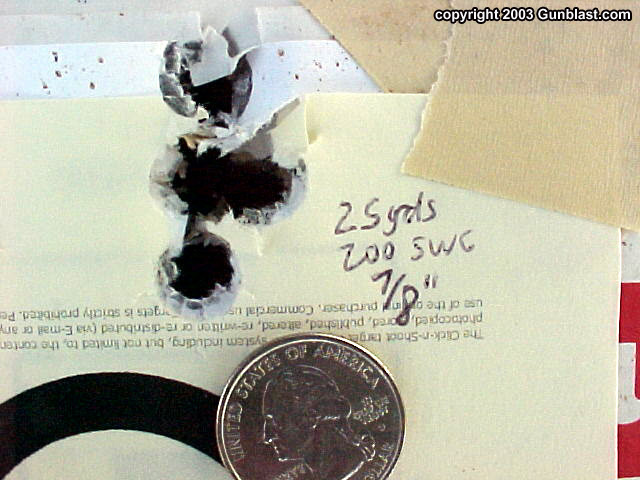 The target semi-wadcutters were hand loaded with a 200 grain lead SWC over 5.7 grains of WW231 powder. Every single load tested functioned perfectly through the SW99. There were no failures to feed, fire, or eject, even with the forty year old military ammo. 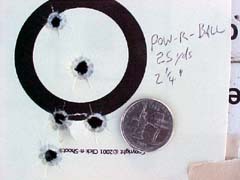 As expected, the target hand loads grouped the best, firing five shots into just seven-eighths of an inch at 25 yards. The hardball and the Cor-Bon combat ammo also grouped very well. All rounds tested grouped under three inches at 25 yards, with the Pow-R-Ball going just over the two inch mark. 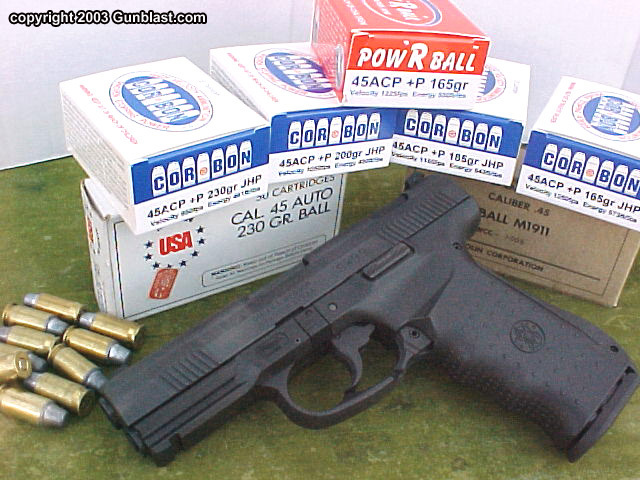 I consider the Cor-Bon Pow-R-Ball to be about the best .45 ACP combat ammo available. The .45 SW99 from Smith & Wesson is a first class modern auto pistol, very well suited for police duty, or for a civilian who likes the power of a .45 in a reliable, accurate, yet relatively lightweight package. Of all of the .45 caliber polymer auto pistols on the market, the SW99 has the best feel, to my particular hand. The Smith & Wesson Model SW99 in .45 ACP is a first class auto pistol. The SW99 comes supplied with a cable lock, plastic case, two magazines, and an extra interchangeable backstrap. The forward portion of the polymer frame incorporates an integral accessory rail. A feature sure to be appreciated by southpaws like the author is the ambidextrous magazine release. This very well-designed mag release is perfectly positioned for either the trigger finger or thumb of the strong hand. The SW99 features a red loaded-chamber indicator at the rear of the massive extractor. 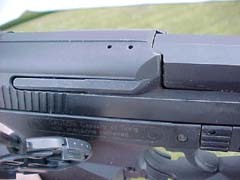 The rear of the striker protrudes from the gun when cocked, serving as a highly-visible and tactile cocking indicator. 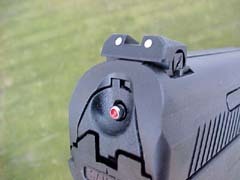 A manual decocker is located on top of the frame, allowing easy operation without getting near the trigger. The grip of the SW99 is well-shaped and textured for a firm hold. An extra interchangeable backstrap with a different shape is included, allowing the grip to be tailored to the individual hand and adding to the excellent ergonomic qualities of the gun. Jeff tested the SW99 with a wide variety of ammunition, including handloaded semi-wadcutter target ammo, USA commercial ball, military surplus ball, various Cor-Bon loads, and the excellent Pow-R-Ball defense ammo. The SW99 proved to be very accurate, as well as 100% reliable. All ammunition tested grouped under 3" at 25 yards, with Jeff's target SWC handloads turning in the best groups, averaging 7/8". The Pow-R-Ball also showed good combat accuracy, with 2-1/4" groups representing the norm. 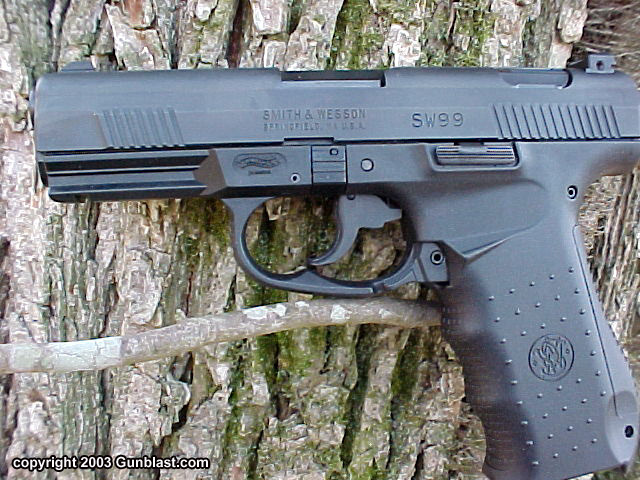 The Smith & Wesson Model SW99 proved to be a reliable, accurate, and relatively lightweight pistol. Jeff considers it to be an excellent choice for those seeking a full-sized .45 ACP without the weight of an all-steel gun.